Biblio (115) How much time do French allocate to shopping? INSEE (the French national statistics office) has just published an interesting report on the time French dedicate to shopping (as well for everyday things as food, as for choice items as clothes). According to the analysis of a series of data between 1974 and 2010, French have reduced their shopping frequency and they spend more time during Saturday, going to longer distances to get the items they purchase. As of 2010 the average French uses 2 hours 41 minutes per week for shopping; between 1974 and 2010 women have reduced the weekly time for shopping some 28 minutes, while men have increased theirs by 21 minutes. Internet shopping is still reduced in France. 20% think that shopping is a chore, while in 1986 those were only 10%. Here is a problem common to many areas (sure, China probably sees it from a distance…). This text looks at how things go in France. With no clear answer, as anywhere else. Rural areas near cities, coasts and urbanized valleys. The best connected areas, somehow linked to the dynamics in big urban areas. 26% of the French population. Old rural areas with weak population densities. For those familiar with historical French geography, the “empty diagonal” is still there… 84% of the French are there, enduring a weak economy. So, in the end, 56% of French living in urban units over 10.000. 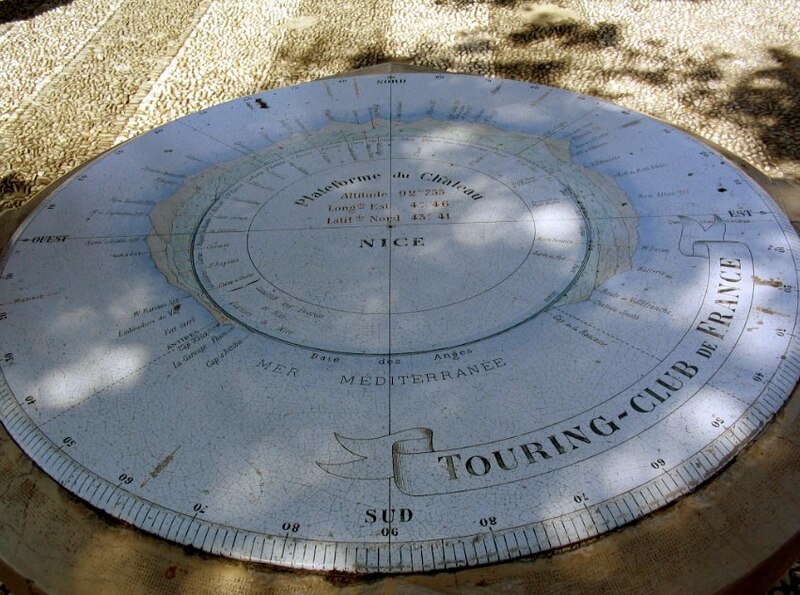 Some years ago, while in Paris, I had a chance to listen to a speech by Jean Paul Lacaze, a French urban planner among those that had been everywhere in all the relevant places, as he explained a curious story. He talked about the French experience with new towns, and the growing complexity of the criteria to choose a place (to erect a city, an industrial area or whatever) in consistency with the sustainable development paradigm. He spoke about the urban planning project linked to the Lacq gas field, in Pyrénées Atlantiques. The field was discovered in 1951 and is somehow the origin of the present Total oil group; there are some parallels with the current shale gas, as it was a hard to obtain resource (high proportion of hydrogen and sulphur), but a relevant input for the national economy. Lacaze said that while the presentation of the project to the press around 1957, the mayor said something like “we chose the better place, no doubt; Jean Paul and I, we drove for an entire day on my car around the municipality to find it”. That is a far cry from what could be considered good practice now, but it is how Mourenx, a city of 7.000 now (10.000 in 1968) appeared. The gas field closed in 2013, and the economic base of the city suffered, as in many other mining areas, even if there is a set of industrial projects. The city seems clearly a “ville nouvelle” of the first model, even a hybrid with the previous “grand ensemble” model. It is an architecture of lineal multi-storey blocks on a rather regular street grid in which every chance is taken to introduce a curve (and the terrain gives some room for that). That day, Jean Paul and the mayor chose a relatively flat area surrounded by two large sets of hills giving a certain visual protection when seen from the close industrial areas. Each neighbourhood has a tower, but individual homes have become more important (after all, that is France). The Plan Local d’Urbanisme is being revised, with moderate growth previsions. INSEE, the French national statistics agenda, has published a study on a set of 30 indicators about quality of life in different parts of that country. – Planes. Lots of them (one of the busiest airport in France), which you can see take off and land, as the runways seem an aircraft carrier; you feel you can almos touch them, as here the approach is curved (I never saw something like that, at least in Spain), and this makes traffic all the most spectacular. 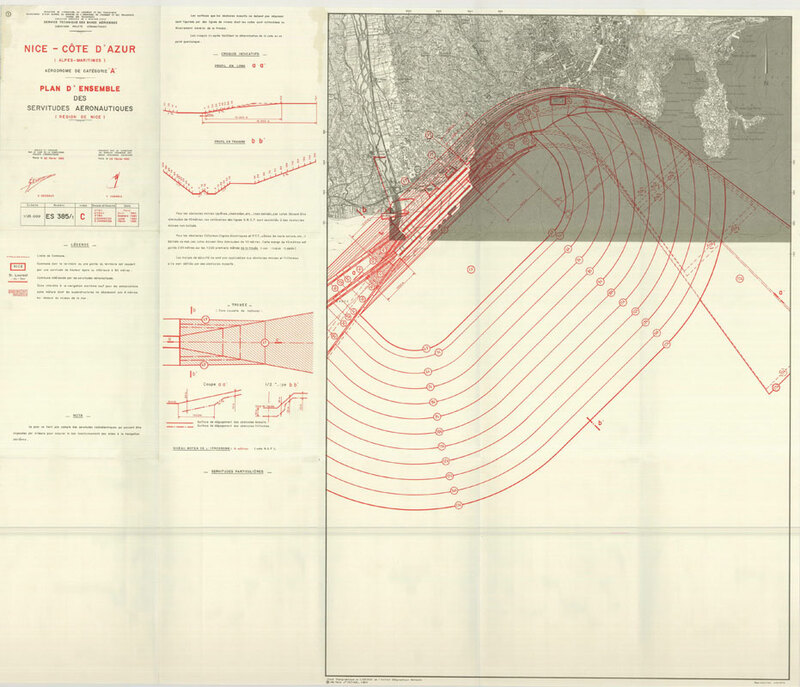 The aeronautical servitudes map seems an Enric Miralles’s architecture. – The beach is quite active; cobblestones, so less hospitable that sand beaches. 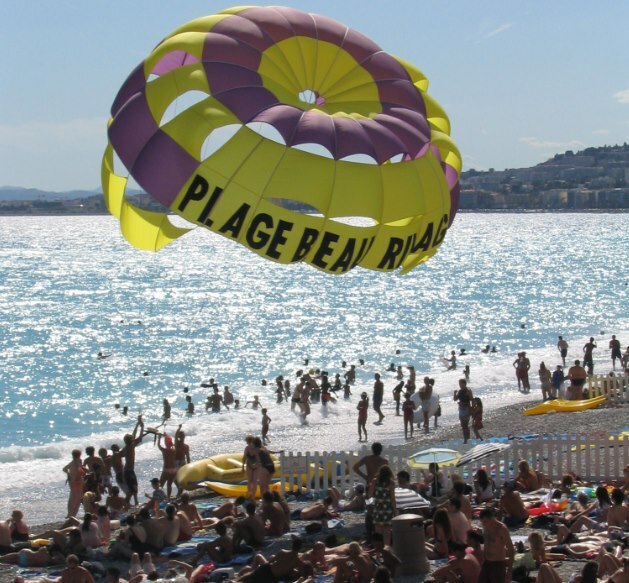 – The Promenade des Anglais is quite used. Compared to other more modern sea walks, its beach sidewalk is utterly simple (its prestige comes more from the buildings on the land sidewalk), but seems to work well; it is wide, the most important thing, and at least it is not cluttered with nonsense stuff. – Seen from a distance the hills could be almost anywhere in the northern Mediterranean coast. The percentage of eyesores on the landscape is lesser than in Spain or Italy, but they also happen to exist. 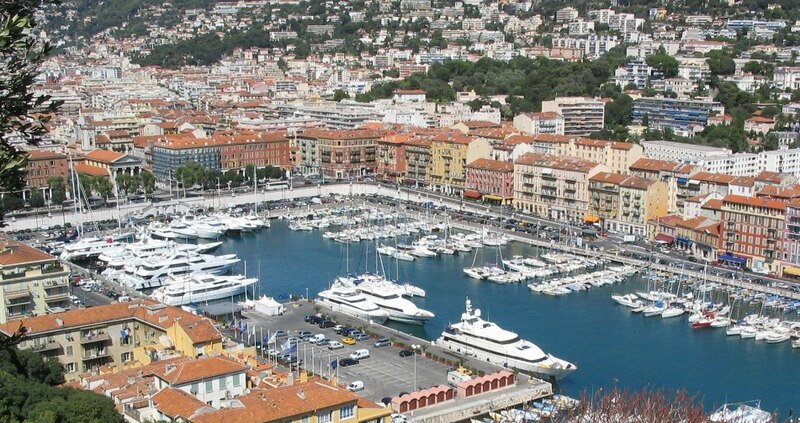 – On the harbour there are many yachts the size of a navy corvette (although not as many as in Monte Carlo). In fact, that area seems among the least active of this landscape, but it attracts the eye in a quite ordered wharf, which still shows the Italian origin of the city. This is an online version of a 40 sq m digital model of greater Paris currently being exhibited at the Pavillon de l’Arsenal, one of the main watering holes for visiting architects in Paris. Worth a look to understand the ambitious urban projects associated to a new metropolitan rail network and other things architectural and urban happening right now in the French capital.